Review posted January 17, 2019. 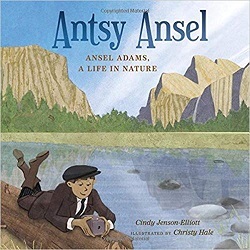 Here's a picture book biography of Ansel Adams, famed photographer, especially of our national parks. The language is simple, appropriate for younger elementary school students. But a lot of information is packed into these pages, with more in the notes at the back. The author relates Ansel Adams' life to kids by telling us he was a child who could never sit still. "Keep him calm," the doctor said, "away from light and sound." Ansel yearned for wind and waves. "Give him discipline!" the principal said. Ansel felt like a fly buzzing inside a jar. Ansel's father had a different idea. "Give him open air," he said. He took thirteen-year-old Ansel out of school and let him learn at home. When Ansel was fourteen was when his family first visited Yosemite -- and they gave Ansel a camera. I like the pages showing Ansel in Yosemite. The picture of Half Dome turns the book on its side to capture its tall majesty, as does a spread with a Sequoia.